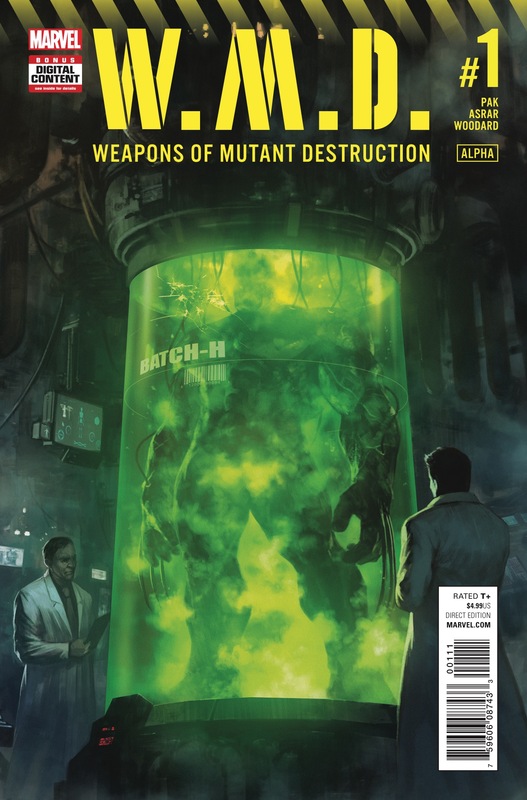 Weapons of Mutant Destruction #1 Review – AiPT! The most 90’s mini-event to hit stands in recent memory kicks off this week and it’s all about combining powers to make a super monster. Amadeus Cho, Logan, Sabretooth, Domino, Warpath, and Lady Deathstrike aim to end the terrible science experiments, but can they do it before they’re killed themselves!? Greg Pak knows how to write characters. Even better, he knows how to write characters when in the team format. That’s a tricky thing to do, as you can’t let any of the characters disappear or have nothing to do, but also need to progress the plot at the same time. We’re in good hands. Mahmud Asrar meanwhile, has been killing it on Totally Awesome Hulk and will clearly kill it some more while drawing heroes killing even more. Bring it on! This issue opens in a surprising way following the delivery of pizza to an unknown group of folks. We enter a high-security area, but it’s a seemingly peaceful neighborhood with kids and everything. As Pak and Asrar take us deeper into this compound we learn things are not as they seem. The biggest crime is how the evil scientist likes bad pizza. Gasp! Cut to our heroes, who aim to take down these bastards with all the killing you can think of. It’s a nice switch between “bad guys” and “good guys” and it’s a reminder nothing is ever that simple. Just a regular place of work. Yep! As the story kicks into gear, Pak does a good job establishing the relationships between these characters and their attitudes. That includes Cho, who is very good at what he does, and a nice team-up of the minds takes place between he and Logan. As the story progresses readers will be in for a surprise action sequence and further fleshing out of the villains that will be attending this story arc. Asrar draws a sharp issue, keeping the characters’ personalities clear and always present. The opening sequence, in its calm and suburban charm, helps convey this villainous operation is run by average folks who just put in their 9 to 5. The body language of the guards for instance, helps set up the fact that something like this could easily be happening in your neighborhood. It grounds the eventual reveal and helps remind us these characters live in the real world. Plus there’s some awesome hero vs. cute animal action! This issue is decidedly light on action with only the one scene and said scene doesn’t involve any super monsters or familiar villains. No, much of this issue sets up the villains and the mission our heroes are on. Given the last two prelude issues it’s unfortunate because the story isn’t progressing very quickly. Clues are found and leads are set upon, but it’s all moving rather slowly and could have used a punched up action sequence to bide our time at least. If you’re not raring to go for this story arc then you may not like fun. Okay, you may not like 90’s fun. Bring on the mutant abominations! A fun issue that has some detective work and a great setup of the villains.